My cousin's fiancees bridal shower was a success. She had a good turn out of people, it was fun! We played a couple of games and ate some delicious food. I made sure to steer clear of the carbs, but I did have some chicken parmesan and it was so good. She made these little favours to give to everyone for attending. They're homemade whipped soap! It's so cute! It looks so fluffy! 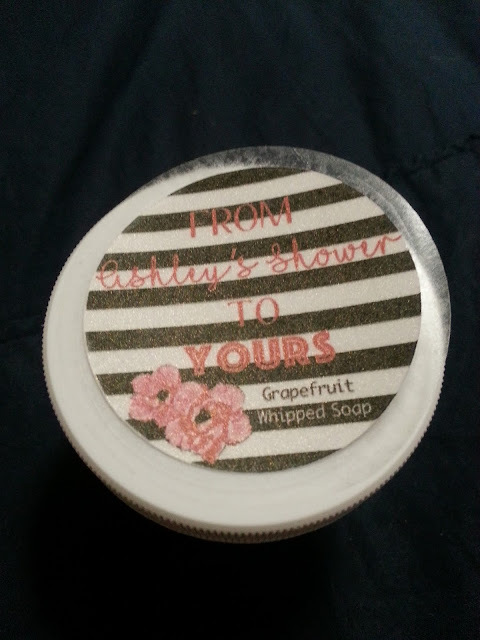 I got the grapefruit scent and I can't wait to try it out! There was another scent, but by the time I got to the table they were gone. 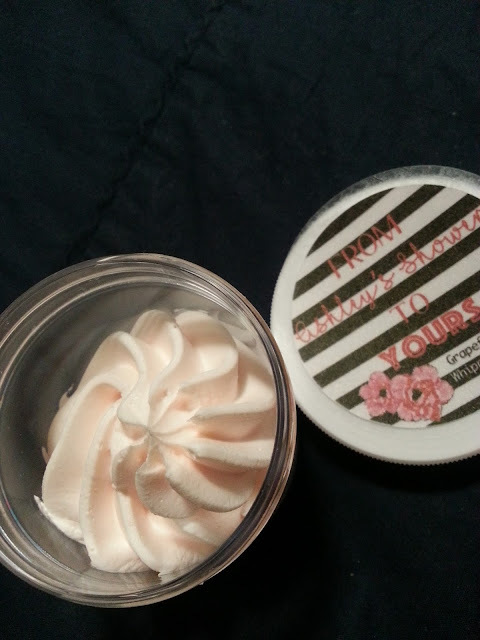 I've never tried a whipped soap before, but I'm sure it will be great! Also at the shower I won the door prize! It was a Hidden Gems candle, same idea as Jewellery in Candles, or Charmed Aroma. I find it so crazy how sometimes I can go a long amount of time without qualifying for any free boxes. Like Influenster, Glam Sense, etc. Well these past two to three weeks have been great! I got a Nivea body care set from ChickAdvisor, a Spring Vibes VoxBox from Influenster, another Sampler kit that contained a full size box of McCafe k-cups, and then I came home today from grocery shopping to find two campaigns from Glam Sense. 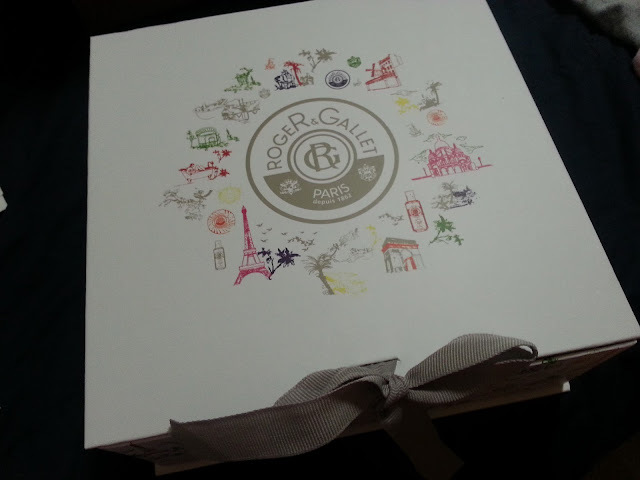 I qualified for this Roger + Gallet box (I've never heard of this company) and a full size Make Up For Ever water blend foundation! It makes me happy because that means I have more reviews for you guys! 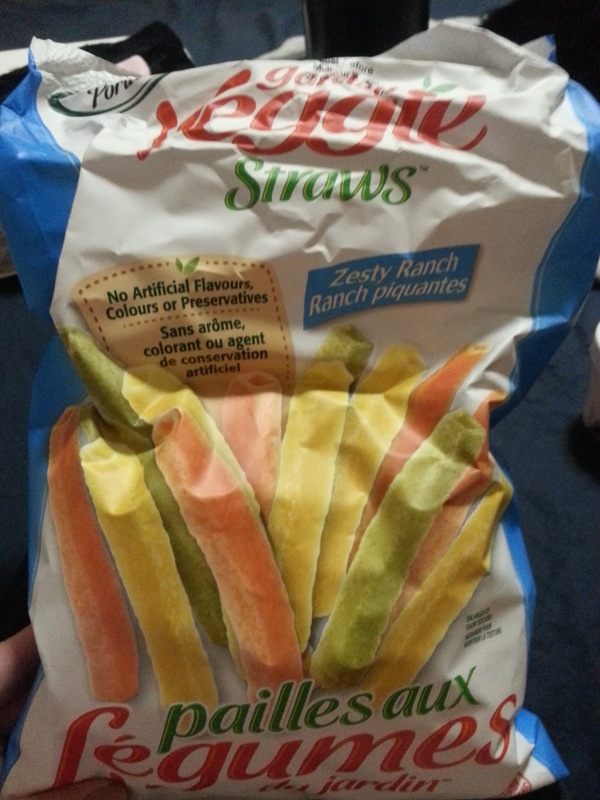 Have you guys ever seen or tried these Garden Veggie Straws? They are so good! There are very few things we can snack on through our diet, and these feel like a cheat! But they have 22g of carbs for 55 pieces! We will count how many we eat, which is usually half the serving, and they fit into our daily carb limit. There is this ranch flavour, a rosemary and olive oil, and plain old salt. There is also another in the shape of an actual chip. Obviously they aren't really veggies, but they make a nice light snack and helps when you just want a small handful of something crunchy! All three of those flavours have been delicious. I find them at No Frills except for the ranch flavour, I've only seen that at Walmart. I ordered this short-sleeved jersey dress from H&M. I wanted to wear it to the bridal shower last weekend, and what a mission it was to get it. I figured for $20 it was pretty affordable and something I could re-wear all summer. Plus it has pockets. So I order it, it's marked as shipped the next day, and then it's scanned as out for delivery, then scanned back into their mail system, and it ended up being returned to H&M. I wasn't very pleased because I wanted this dress, and I needed it in time for the shower! I ended up getting an email from them with a 25% off coupon, and free shipping. I guess for the inconvenience, because I really didn't want to return this, it didn't even make it to me in the first place! Anyway, I reordered this dress, and the same one in a darker pink colour that was on clearance for half the price. With the discount code, and free shipping, I ended up paying less for two dresses than I did for one. They're very comfortable, and I'm going to be sure to wear them a lot this summer, especially after what a hassle it was to get here in the first place! And the real kicker... the warehouse that it ships from, is literally 10 minutes away from my house. Who knew!? My Scentsy order arrived on Friday last week! I placed an order in the beginning of the month for the Bring Back My Bar scents that were voted in, and are only available during June... and then they released a summer collection of products that were new, and I needed to try. These are all new to me scents, and haven't been released in a long time. Summer Sippin' - Sun-ripened raspberries and tangy lemons will make you wish it were summer. I was really hoping that this would smell like raspberry lemonade. But you get almost no lemon scent. It's nice and fruity, but a little light. I like it! Hawaiian Paradise - Buffet of Hawaiian fruits-pineapple, banana, mango, papaya and coconut. THIS. This is everything. It's fruity, it's strong. It's amazing. You know what it really reminds me of? Rocket candies, with a tropical twist. Or smarties for you Americans. It's such a sweet scent, and I loved it so much that I ended up ordering a second bar, because this hasn't been around in a long time, and I have no idea when it will be back. Even my boyfriend kept commenting on how much he liked it, which is a very rare occasion! If you're looking to try fruity scents, this is a winner! Root Beer Float - Concoction of old-fashioned root beer and creamy vanilla ice cream. Yup! Creamy, fizzy, root beer! I haven't warmed this yet either, but I'm super excited! I've wanted a root beer type of scent for awhile! Baja Breeze - Enchanting blend of tropical fruits and flowers. Not very descriptive, but I love tropical fruity smells. I was hoping the flowers wouldn't been too strong in this one, and it isn't, but it has somewhat of a powdery scent to it. While it's not terrible, it was my least favourite from the six I ordered. Grapefruit Blossom - Tangy grapefruit with a splash of lily flower. I don't smell lily flower at all, but I absolutely love the grapefruit in it! It's tangy, it's citrusy, it's grapefruit! So good, I can't wait to get this into my warmer! Coastal Strawberry - Earthy, fruity strawberry vine and raspberry seeds over jasmine petals. This is mostly a strawberry scent to me. It's more of a real strawberry scent at that. I can't really smell the "earth", "raspberry seeds", or "jasmine petals"... just a light, more natural scented strawberry. I like it as well, and glad I grabbed it. Go, Go, Mango Washer Whiffs - Juicy mango sliced with melon and berries, garnished with bright hibiscus and sweet banana flower. I love the Scentsy Washer Whiffs. They're pretty much the same idea as Unstoppables. These are very fruity, and they will be perfect for the summer. I absolutely love taking my clothes out of my drawers, and they still smell like the washer whiffs. 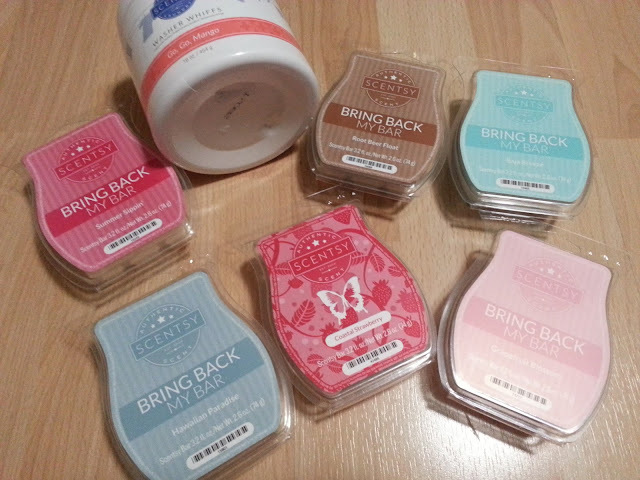 If you're interested in trying any of the Bring Back My Bar scents, you'll need to order before the end of the month! Once they are gone, they are gone for good! And I mean it about the scents I've picked. I've been buying Scentsy since 2012, and those are scents I've never heard of or tried! Of course there are a couple that are in the lineup that I've tried before, but I always try and get the ones that are new to me! Check out all of the other BBMB scents here (they can also be added to the combine and save packages where you get a discount on 3 bars, and 6 bars. Just visit the combine and save page here! ), and the rest of the summer collection here. And as always, I'd really appreciate it if you used my link to purchase. And if not, that's cool too!